It is a classic. Forever trendy. The best dessert you could possibly serve your guests at your wedding. Muddy Paws Cheesecake has catered over 9,000 weddings with cheesecake! Our wedding couples have all told us how excited their guests were to be served cheesecake! Muddy Paws Cheesecake offers several ways to serve cheesecake during your big day. Call to set up an appointment with Meg or Tami and they'll ensure all of your expectations are met. An assortment of 9" cheesecakes in several different flavors, with a separate cheesecake for the bride and groom, if they desire! With 8 different sizes ranging from 6" - 12", the options are endless for display options including fresh fruit, your wedding flowers, cheesecake toppers. Cheesecakes make beautiful centerpieces! Giving your guests flexibility with a variety of flavors is the perfect option for dessert and allows guests to serve themselves after dinner. 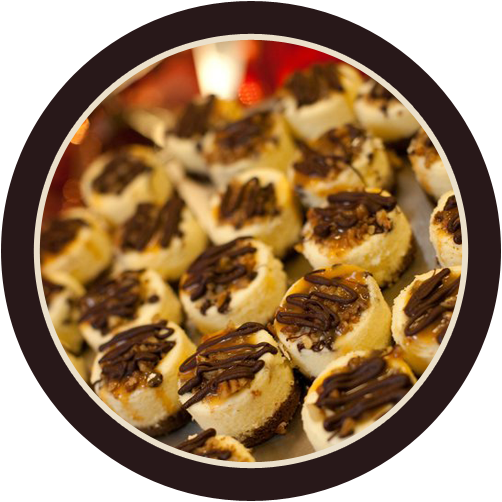 With two different size mini cheesecakes, this is a great way for your guests to indulge in a variety of flavors. Combining full cheesecakes with mini cheesecakes might be the perfect fit for you! Muddy Paws Cheesecake offers Twin Cities Metro area deliver of your wedding cheesecakes to your reception location. (Extra Charge for Delivery) You may also pick up and set up the cheesecakes yourselves. They travel perfectly and set up easy! Our cheesecake food truck (the world's first!) that is out of a vintage camper! Hire us for your next event or for your wedding! www.campcheesecake.com or email us at yummy@muddypawscheesecake.com for info.